Robert Young Pelton heads deep inside the jungle of Burma to meet rebels, mercenaries, missionaries, and monks. All are engaged in the world’s longest running civil war. At the center of this conflict are the Free Burma Rangers, led by a former US Special Forces soldier known as The Father of the White Monkey. Kawthoolie – The distant sound of steady mortar fire didn’t seem to bother Lt Col Nerdah. Nerdah is the 41-year-old commander of the 6th Brigade and the son of the late Karen supreme commander Bo Mya. The commander had changed out of his dress uniform and was now relaxing by candlelight wearing a black t-shirt and beret. Nerdah had just concluded a busy day of peace celebrations between the DKBA (the Myanmar government-backed Buddhist faction of the Karen) and the rebel Christian faction. But the day wasn’t over yet. “There are about 100 government soldiers making their way toward us. I will send my men to attack them and mine the way. It will not happen quickly.” Turning our attention to the dinner of rice and tinned sardines it seemed just like yet another day in the 60-year-old war between the Burmese government and the Karen rebels. The Karen have been fighting their war of independence ever since the British gave national sovereignty to the Burmese after World War II. Like many other ethnic groups pitted against a brutal regime, the Karen view the Burmese as historic interlopers and brutal oppressors. The outside world sees the conflict as an endless internal war generating countless deaths and hundreds of thousands of displaced people. And while there are signs of progress — President re-elct Barack Obama and Secretary of State Hillary Clinton are slated to visit the country this month, which will be the first visit by an American President in more than 50 years — a recent report by the International Crisis Group reaffirms that Burma has long been on the brink of internal collapse and that, in reality, little has changed. Today, the Burmese government and the generals control the central delta area while the ethnic groups surround them. The country is divided into black zones where free fire is allowed, brown zones where rebels are under control, and white areas where there is no fighting. My trip is to the black zone just east of the capital city, Yangon. The steep, remote area is made dangerously beautiful by limestone cliffs, lush valleys, dense jungle and unspoiled rivers, like the Salween. It is here in the unrecognized nation of Kawthoolie (no one can quite agree on the source of the name) that the Karen rebels appear to be making their last stand against the ethnic cleansing, slow strangulation and constant attrition imposed by the Burmese generals and their 300,000-man conscript army. I came to Burma during the elections. The first ones held in two decades. The rebels and minorities assumed the Generals would win and would use that win to launch a decisive offensive against the Karen. The United Nations and much of the Western world considered the elections rife with fraud. Not surprisingly, the State Peace and Development Council won handily. As a symbol of the party’s confidence, it released former democratic leader Aung Sun Syu Shi from house arrest. Although the event was noted around the world as a positive sign, it did nothing to help the millions of ethnic groups still fighting the government. If anything, her arrest rekindled the flame of resistance — releasing an elderly woman to a defunct party seemed to show that her cause was extinct. Some ethnic military groups, like Nerdah’s, moved against Burmese government forces after the election. The current result was the fighting that was coming our way. To the outside world, it may have seemed that the war between the ethnic groups and the Burmese had grown stagnant — it was, after all, the longest running civil war in the world. Even the Lonely Planet guidebook and agreed that it was safe to visit Myanmar. Sylvester Stallone filmed the fourth installment of his Rambo franchise along the Salween River and raised some awareness of the area. But with higher-profile wars in Afghanistan and Iraq, it seemed the rebels were doomed to obscurity. I first became interested in Burma when I heard that a friend of mine, who I encouraged to go to Burma in the first place, was hanging out with the rebels. But even more interesting to me was the long-standing relationship between mercenaries and the Karen rebels. In he 1980s I had heard about the frontlines of Burma at Soldier of Fortune conventions in Las Vegas. Eager doctors, loud braggarts and quiet vets talked about war there, and the wink-wink part was that if you wanted to wield a gun, camera or scalpel, adventure awaited you in Burma. Many viewed the fight as a holy war where the Buddhist-but-rather-odd gaggle of Generals were intent on wiping out Christian hill tribes. The Generals seized power in 1962, creating the country’s longest running military dictatorship. In reality, though, the war between the Karen and Burmese had gone on for centuries. The Karen have long since been an agrarian hill people who have viewed the Burmese as aggressive interlopers. Though this interloping may date to the 9th century, it continues to this day as the Burmese slowly, methodically and brutally eliminate, integrate and intimidate the Karen and other ethnic groups into submission. The most likely explanation for why the generals haven’t totally wiped out the Karen is the people’s inherent skills as classic jungle guerrilla fighters with a history that goes back to supporting the British against the Japanese, which led to the inability of the Burmese rulers to provide ethnic representation inside what is now Myanmar. It is clear from watching the non-government controlled areas shrink over time that the Karen are losing. There is another reason war continues. 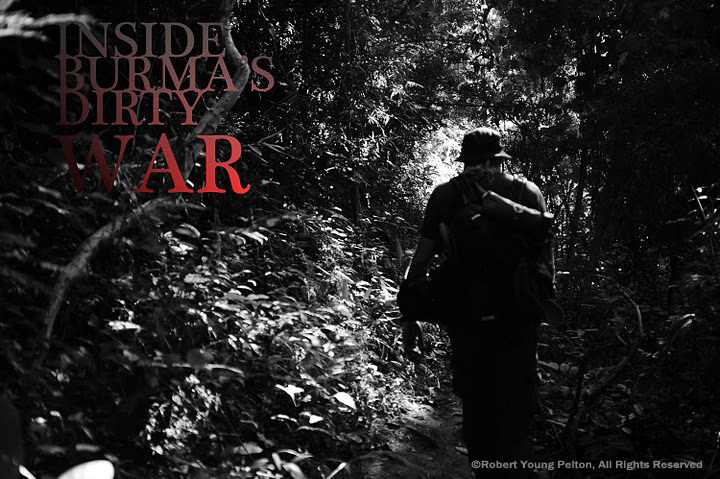 War is a business in Burma. War keeps the Generals in power and the rebels fighting. The Generals of the State Peace and Development Council (SPDC), formerly known as the SLORC (State Law and Order Restoration Council), generate one 100 percent of the their foreign direct investment for natural resources (minerals, oil, teak). The international monetary fund estimates that the Generals have $5 billion in foreign currency reserves , and that they’re ‘working’ the disparity between the official exchange rate for natural gas at 6 kyat for every U.S dollar externally, but internally providing 1,000 kyat for every dollar — keeping the 994 kyat and dropping only kyat in the national bank. That neat trick earns Myanmar the label as the third most corrupt nation, according to Transparency International (only Afghanistan and Somalia are considered worse). There is also plenty of money for Russian fighter jets (20) and helicopters (50), Chinese light attack helos (50) and troops (300,000), and an embryonic nuclear program. The grim statistics firmly place Myanmar at the bottom end of the world’s list of countries. The Karen National Union (KNU) and its military arm, The Karen National Liberation Army, have been fighting this war for 60 years, since the first post-colonial battle on January 31, 1949. The Karen, however, have not been not without the suspicion that the Karen leadership have also turned the war into a business that supports an aging Karen infrastructure. More war, more funds; no war, no funds. KNU leaders collect the donations and supplies and do not pass them down to the troops (who fight for free) or the villagers. The Generals keep a tight lid on coverage of circumstances in Burma, and the rebels, by virtue of their isolation, get little to no coverage of their fight. Rob, 39, is a friend from California and former toiler in the LED-lit trenches of the Hollywood special effects factories. He is animated, multidimensional, attention-deficit-disordered and, for once, at peace with his new life as a volunteer and local restaurant owner. We sit above the river overlooking a postcard scene of tropical beauty — a place used by Hollywood to film movies like Air America for its similarity to Vietnam in the 60’s. As he shows off his girlfriend’s ta tim deep fried fish specialty, he looks for a way to sum up his life and reasons for being here. “I put digital pants on dead VC in Apocalypse Now Redux.” His air quotes create a humorous epitaph. He continues, “I was Charlese Theron’s driver… Her mom was hot… I was a cocaine dealer, a bouncer at a lesbian bar, former skate punk, worked a halibut boat out of Cook inlet, an editor on the Gotti show. I even edited Intervention. He pauses in that ADD style. “We cut out the parts where the guy was smoking crack out of a broken light bulb while another guy was blowing him. “I was sitting in a cubicle working stupid hours… making $100,000 and spending $100,000. Getting fat, frustrated and heading toward 40.” He flips out another Marlboro Light from a pack adorned with a gruesome photo of a cancerous liver. He’s well prepared for the trip into Burma. He’s done it 17 times now and has a cupboard full of gear. Hydrating salts, foot care, HEST knife, Becker patrol pack, short machete, local bug juice (“You’re done having kids right?”), and one wet outift, one dry, a pair of US-made jungle boots… and the look. Rob has been here a year and slowly been accepted into the expat community of NGO’s and freelance foreign military advisers. The difference is that the military folks who come over for two weeks or so don’t fit in. They go directly from the airport into safe houses. Every square inch of white skin has to be covered up. It bothers Rob that a lot of them seem to be on holiday, drinking loudly and showing gory pictures at local bar. “The Thais are cool with the humanitarian stuff as long as it’s on the down low. But some of these military guys are just genetically programmed. I guess they way they carry themselves, haircuts, clothing.” This nameless town is just one of the gateways for mercenaries, missionaries and do-gooders who come to help the rebels. But it is another foreigner in particular, an American, who most drew me here to Burma. He is perhaps the most influential and effective Westerner working behind enemy lines to help the rebels. He has acquired an almost legendary reputation. In these parts he is know simply as The Father of the White Monkey. Getting inside is simple. Look at any map of South East Asia and you can cross almost anywhere along Burma’s hundreds of miles of unguarded border. I chose to sneak in with Rob, who has spent some time with the major players. To get there requires hours of driving mountainous mud roads to get to a major river, where you’re then hidden under a dirty tarp and ferried to any number of Karen refugee camps along the border. In an odd love-hate relationship between Thailand and Burma, both sides agree to pretend that if each sees nothing, there is nothing to report or even to crack down on. But if you mess up and get flagged, you could be responsible for shutting down the life supply for thousands of desperate refugees. The refugee camps aren’t the grim, tent-like affairs that smell of human waste and suffering. Karen IDP camps are clean, orderly with self-appointed management, security, logistics, bamboo houses and spotless latrines. People smile and wave and food, blankets and mosquito nets appear without prompting. This is one of the Karin’s main problems. They are stubbornly cheerful and resourceful, even in the worst of times. It may be this collective power of optimism, selfless charity, and lure of lost causes that binds outsiders to them. We’re inside. We sleep in a classroom used to teach young Karen medics. We have been trying for days to contact Thai Boon, the head of “Ranger 49,” on the sat phone. Thai Boon is the man that can send us inside to meet the Generals and the foreign fighters. That night when we go to Nanji’s store for our nightly can of warm Chang beer, we find him cross-legged on the split bamboo floor. My first thought is that he looks and talks exactly like Jackie Chan. He invites us to sit down. He hasn’t bothered to turn on his sat phone in who knows how long. “Where did I go to school? Harvard!” He laughs. “No, I have a grade 4.” He laughs louder. Thai Boon,47, is the son of a KNU bigwig. He runs Ranger 49, named after the year the war started, though he doesn’t really have soldiers nor is he a Ranger. But he runs the foreigners in and coordinates training. Thai Boon has been called here to meet with the Generals. Heads of the 5th, 3rd, and 6th brigades are here. Although Karen state is separated into 7 “brigades,” the 4th fell in the rebels’ June 2009 offensive, and the 7th fell soon after. Rob and I are not gaunt tri-athletes. I am 6-4 and 240 pounds, and the last time I took a serious walk in the jungle was at gunpoint after being kidnapped in Colombia in 2002. Rob and I look at each other. How could we say no? “Dawa” is the home of the legendary Free Burma Rangers, or FBR as they are called. To some, the FBR is an “up the river” paramilitary force run by a deeply Christian, former Special Forces Major who goes by the name The Father of the White Monkey. Others will tell you that the FBR’s secretive leader is the most effective foreigner working with the rebels deep inside Burma against the Generals. Thai Boon waves his hands. “Crazy Amish Christian relief people. It’s hard to tell where they begin and where FBR begin.” Boon and Rob are reticent about the “gullawa,” or white people, who are currently inside Burma. ”The normal tour is a two-week vacation or leave. I don’t really get into to what they do. Some of it is above my pay grade. I have heard stories,” says Boon. The next morning we have visitors. Two thin Italians from Lake Garda who rebuild villages inside Burma for an NGO called Populi, and a young American who is clearly ex-military. They have walked three days from the interior to reach here. The American says he is “security.” It’s hard to imagine what one unarmed person could provide in the way of security, but he says he is along to determine enemy troop positions and navigate the humanitarians safely in and out. The Italians were going to travel further until they found out that a three-day hike takes five days. They turned around seven hours short of Dawa. Rob and I remember to factor this in. The Karen estimate travel time for themselves—not for heavy, lumbering gullawas. We decide that if we make it to Dawa, it will be an accomplishment. Jack first connected to Burma through Karen expat, Robert Zan. Zan was a former commander in the Karen army who now lives in Minnesota and raises money for Karen in the US. Jack’s next step was to get in touch with Thomas Bleming, a Vietnam vet in his 60s who wrote a book about his brief time in Burma and what appears to be his conversion from self-described PTSD effected Vietnam Vet to journalist to mercenary. “In my Google searches,” Jack says, “I would come across Thomas Bleming mouthing off. So I made contact with him. He spent the next three months trying to sell me his book. His book is basically a road map on how to get in. He invited me to meet him here. Jack’s newest idea seems the most far-fetched and most lethal. “I want to use an ultra light. Fly it out of a small strip… Ultra lights can carry 250 pounds…You can arm them. I put an M16 on an ultra light with a scope and night vision. You shoot from 6000 feet… the bullet goes straight down… We tested in out in the desert near Fresno. We laid out a bunch of soccer balls, something the size of a human head… Start at 16,000 feet and glide in. It takes about three shots during the day. At night it takes longer, six to seven shots with night vision. “You can buy them for 16,000 bucks. It seats two side-by-side, or pilot and load.” Jack is full of ideas. “I can get Glocks for 45,000 baht ($1,500 USD). I can get M1s for 25,000 baht ($830) all day long. I can get all the ammo I want. But I am broke. I am about as broke as they come.” His clients call. Time to cross the river. Late at night, Rob and I are sitting on a rough-hewn bamboo bench listening to the sounds of the jungle at night. The creek burbles, people inside their huts are singing and the usual group is watching a Mr. Bean DVD on the battery powered TV for the umpteenth time and laughing at the exact same spots every time its played. The stars burn through, and we stare up. Rob talks about death. “I had thyroid cancer. They took it out. Had a Cambodian kid in Seattle die in my arms after he was shot in a drive-by. Found a dead homeless guy that was stabbed. Those things seem to gravitate to me.” A satellite tracks across the sky as we sit in the cool of the dark. “My girlfriend shot herself. When I was 22. We broke up. She went out and bought a Remington 303. She called my friend, ‘Is Rob there?’ And then shot herself. I had to go pack and clean up her place. I found pieces of skull and brain in my clothes. I kept going in a downward spiral. Like a tuna before you gaffe it.” He doesn’t have a funny ending. He pauses. “Eighteen months I was working in a cubicle. Now I am here.” A shooting star interrupts him. As we hike up from the river there are two geriatric silver-haired men drinking their morning coffee discussing old times and acquaintances with a liberal dose of profanity. They are here to train General Bo Jo’s Special Forces. They are both Vietnam-era Special Forces vets, one with time in Germany and Cambodia and now training contractors in the US. A few yards away a fire is cooking two pots and what looks like a very large vine. On closer inspection, it’s a freshly killed python. The Karen eagerly drag the 8-foot snake across the coals to cook their morning delicacy. While the two Americans continue their good spirited but foul-mouthed conversation, I talk to 48-year-old General Bo Jo, the commander of the 5th Brigade—the most active and largest of the KNLA army. The 5th Brigade has about 1,300 men under arms, and is up against about 3,000 Burmese troops. General Bo Jo’s grandfather worked with the legendary “Grandfather Long Legs” and spent time in prison with him. He began as a Sergeant in 1982 and has been a General since 1997. Like many senior Karen, he has a link to America. His wife is in Indiana working on her PhD. He is not optimistic for the future. He sees the struggle lasting another five to 15 years. He personally visits each village that is burned, and he asks me if I have any idea for a better freedom for his people. After the interview Bo Jo puts on his uniform for photos. He wants to just sit and talk with us. Behind us the python is being served up, two small dogs fight and the cook puts on a large pot of boiling water. Mama noodles, bamboo shoots, fried potatoes, sardines and rice. All washed down with Birdie premixed coffee. By now the two silver-haired Americans begin teaching their classes. Down by the river they have built a small model of a Burmese Army Base. With the aid of an interpreter one of them is teaching the Karen how to attack: “The snipers need to take out the towers, while the rest of the forces fires mortars” The other hobbles off into the jungle with the aid of a cane to start the class on self-defense. A British instructor is working on training the Karen in the use of a shortwave radio. A lot of gear is donated to the Karen effort, and it gear ranges from erasable markers to motorcycle batteries to soldering and wiring kits. Communications equipment is their most important need. A quick inspection of the Karen Special Forces soldiers is not encouraging. Their weapons are battered Vietnam-era Colt AR-15s, some still stamped “Property of the U.S. Government.” Some carry bolt-action rifles and Garands that date back to Korea and World War II. They have rubberized jungle packs and most wear sandals or flip-flops. A few have jungle boots. Some commanders wear tactical leave-behinds by foreign advisors, like Casio watches, binoculars and the most popular gift: telescopic rifle scopes. Before we leave, General Bo Jo asks to have his picture taken with me and to get an autograph. “You are our advisor now”. After almost a week of waiting, it’s time for our march into the heart of the conflict. We take a boat upriver for an hour. Hidden under a stifling black tarp is a doctor, a former electrician and now pastor of a church in Southern California, the wife of a former SF soldier, the wife of a volunteer, , another doctor, a former missionary pilot and head of partners, and a silent American who turns out to be a property tax accountant on vacation with the pastor. We are dumped off on the riverbank as the last light of day disappears. Inside the jungle, it is even darker. We switch on our headlamps for the long walk ahead. It’s easy to both embellish and understate the amount of pain and effort it takes to hump a heavy pack up and down guerilla mountain jungle trails. The best way to describe is to say that one very physically fit and young man would attempt this walk and fail. The doctor along with us has also tried and failed this hike. The distance is only about 20 miles, but the terrain is chosen specifically to deter Burmese army troops. On painkillers and only ten feet at a time, we accomplished the hike. Large holes in the bush were reminders of where sure-footed pack mules slipped off the muddy trails and crashed down the side of the mountain. On the tail end of the second day we hiked down from a mountain, sun baked, thirsty and in pain and ended up in Dawa. There to meet us was the Father of the White Monkey. We’ll call him Doug. Doug was a former Ranger, Special Forces Major and always a devout Christian. He immediately greeted our small group by praying and then loading up our packs for the hike deep in the forest. After a bamboo-raft river crossing, a steep hike up and down, we arrived in a narrow valley. Camp Taw Wah, one of a number of training camps used by the Free Burma Rangers to mentor and graduate five-man teams that spread out across Burma. This camp is in a deep, green valley with a spectacular, boulder-strewn river at the bottom. There are a dozen huts—woven grass roofs, pole supports and made from peeled bamboo. During the day, purple and black butterflies flit in and out, cicadas chorus. The ground is river silt with the tops of giant boulders poking out and bamboo sprays. It’s the start of the dry season. At night the frogs call to each other like ducks, the stars explode and the cold air rushes down. Nights are chilly as the moon slides over the narrow valley with only the sound of people talking softly. At 5:30 in the dark morning, the sounds of PT enliven the camp. Doug leads the exercises in singsong Karen. Before breakfast the recruits chant an English statement for freedom before digging in to massive bowls of rice. The camp is small and the small bamboo huts holds about 100 young men and women. There are three Americans, two of them ex-military, one a computer expert. There is also Doug’s family of three young children and his wife. The two Americans, volunteer military trainers, are joined by their wives who were along for the hike. The gullawas eat at a headmaster’s table elevated above the recruits’ area. Anyone who has been to a military or boarding school would recognize the concept immediately. I ask Doug why he calls his operation “Free Burma Rangers.” Like many of Doug’s decisions, it is intuitive and simple. “I made up the name when I climbed Mt. McKinley, and I had to write down a name. Kind of like the Texas Rangers or the Army Rangers.” He started in 1997 with one local media team and now trains five- man teams from volunteers. They are trained in security, communications, media, medical skills and morale. But Doug makes the point that this is being done by the Karen, not him. Koala Bear, a small, hard-as-rock 37-year-old Karen commander, is in charge of training. Doug and the FBR teams are the best single source of intelligence coming out of Burma. Thanks to his teams, the tactics of the Burmese Army are well documented and distributed via his website. “The SPDC mortars the village, chase them away, shoot and loot, then burn it and leave. The idea is to drive them into camps in Thailand or surrender. They kill the rest.” He has books of photos of murdered, raped and abused villagers. Once singular event that haunts him is a seven-year-old girl, raped, shot at point blank range and left on the trail for the Rangers to find her. Erhausen is the grandfather of the foreign clique. And runs the Displaced Persons Action Committee, supports the Safe Haven Orphanage, and now trains and supports seven demining teams who work with wands to clear mines. He doesn’t look 63 years old, but he joined the US Marine Corps at age17 and fought in Vietnam, working with the Nung tribesmen in the Central Highlands. A briefing document shows that the end may be sooner than the second coming. The Burmese Generals have been eager students of how Sri Lanka successfully ended its 26-year-old war. They simply kept the media out and crushed the Tamils with overwhelming force. The Burmese now have built three-dozen new military bases, ploughed new roads and purchased 62 assault helicopters in preparation for what may be the final battle. The election was simply one item on a checklist to show that the “free and democratic” nation of Myanmar was simply eliminating a troubling insurgency. A campaign of infiltration, assassination, assault and assimilation is expected to begin this year. At that point, the war will be over. The foreigners have lit up the war in Burma, but one by one they flicker and then go out.